The Mud Lite AT has a tread depth of 3/4". Oder them online was at the house is 2 days fedex drop them off had a atv store put them on for 10$ The tires did real good over Easter weekend very good tire for the money you pay for it I pull a trailer had no problem pulling it or spinning out . I love these tires, they are lightweight, flex well and traction is awesome. Mounted them on my 2006 kawasaki Bayou 250 2 wheel drive. I have used this tire on other ATVs in the past, sport and utility. I highly recommend them for loose dirt and mud traction. Will definitely buy again. Just replacing these after years of use on a 2000 Honda foreman 400. Tires have been great. Traction is amazing. I use my wheeler a lot in the snow and out ice fishing. This bike/tire combo has been great. I get around more places then most people with bigger machines get. Only thing I wasn't happy with about the tires was the tread life. Tread life was fair, I wouldn't say horrible, but probably some tires would last a little bit longer. Great value for the money. I may try a different tire this time but hope I don't regret it. These tires have great traction,pushed 10 inches of wet snow with ou even bogging down uphill , down hill it didnt matter never lost traction, didnt even have to put on the chains. tire are great for mud and snow have not been stuck yet.the black top works on front tires some but back tires last 3 times longer. I looked everywhere for a set of tires for my wheeler. After digging around I settled for these tires. I really liked the easy access to RockyMountains website for finding parts. After a full search and many thoughts, I pulled the trigger. I’ve mounted the tires but I’ve yet been able to put them to a test. As for now, I’m really pleased with my purchase. 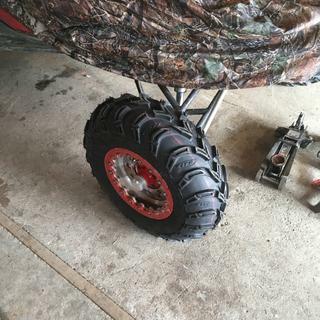 i got these for my Yamaha Bear Trackers.. they are some digging tires.. for 4 wheelers with out 4 x 4 you need tiers with some good tread and these bad boys have them.. These are the BEST tires ever! We were so happy with our first purchase of these tires a few years back, that we decided to buy them again. The tires are on our older Kawasaki Mule and have served it well. We use the vehicle on a farm, working our cattle as well as checking our property. The tires have withstood a lot of rough terrain as well as weather conditions outstandingly. We are VERY HAPPY not only with the product but the fantastic customer service offered by RMATVMC! These people are wonderful, courteous and extremely knowledgeable about all their products. I definitely and most assuredly recommend both these tires and this retailer! ON my second set in 15 yrs, hope to get close to that again. From extreme off roading, trail riding, deep waters/mud down to our cold winters of snow plowing here in Ontario Canada just awesome tires! If i was given others tires to compare with on my bruin 350 4x4 i would give a fair review/comparison. really impressed with the sales staff at rocky mt. The tread is what I was looking for and the heavier ply will last longer. First of all RMATV is awesome at shipping out their products. I ordered these tires 3 days before going up the mountain for elk hunting. They showed up the morning before I was planning on going up. So far they have done great on hard pack dirt roads and trails, soft dirt, rocks, sand, and some mud. Haven't had a chance to try them out in any snow yet which is the only reason I rated the traction and handling low. This Tires are Prefect for what I use them for, At a super great price and Fast Shipping, Thanks Rocky Mountain.. Very good tires, good price. First time out worked great. Went perfectly with the Front Tires same make. Local ATV shop sold for $130.00 each. We have this tire on our farm quads..
And love it.. We live on a mountain. So not much flat ground. These tires grip great .In all kinds of conditions. 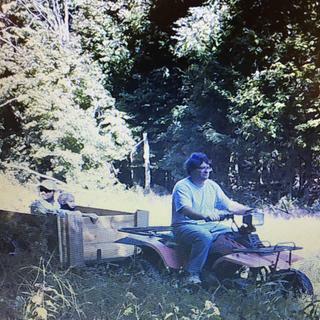 We leave them on year around..
Our quads work hard on the farm..
Hauling wood , hay and what ever we need ..
Bought three of these for my 1984 atc 200. Have amazing traction. Not an uncomfortable ride either, stiff but good tread spacing. These tires are in use or have been on all three of my primary riding machines (1985 Honda Big Red, 1985 Honda 250sx, 1983 Kawasaki KLT250). They are very durable, long lasting, and viable in many different terrain types. Excellent tire for the cost. Very pleased with the purchased of (4) mud lite tires. They look good and handles great. Tires meets expectation and are reasonable price and recommend for replacement. I put these on my 2wd Honda. They ride and pull great. They do slide a little on the wet red clay, but what doesn't... I haven't had them long enough to comment on tread life. I really like these tires and would buy again. Super fast delivery from Rocky Mountain!! Great tire, great price, cant go wrong with these. Bought this set for father in laws kodiak. I have ran these on my grizzly for a number of years, cant beat the quality for the price. Placed on a two wheel drive Honda four wheeler. Digs well, climbs everything my 4wd does. Would buy again. I replaced my old tire with the same one. No need to make any changes since this one did a great job for many years. These tires have been on my wife's machine for a few seasons now. They work great on different terrains. Even with the deeper tread depth they ride fairly smooth on flat pavement or gravel roads and will dig in to get through the mud. The handling on gravel or flat surface isn't as good and that is to be expected with the tread depth. I will be adding a set to my machine when it needs tires again. This is the 2nd set I bought for my Rincon, I have also put them on my 250X and 400EX. They wear well, and are the best value I have had for tires so far. Rocky Mountain ATV/MC is an excellent place to deal with. FAST service, GREAT value. Great tires and great price. So far so good. Great fit and feel . Tires grip the ground great . Have had the ITP's mounted for about a month. Grip and performance is good. Recently swapped out the Swamp-lites for these ITP Mud Lites. Noticed an improvement immediately on dry ground AND deep mud. Excellent handling on my Brute Force 300. Will buy again if i ever wear these out. Great Tire at a Great Price ! 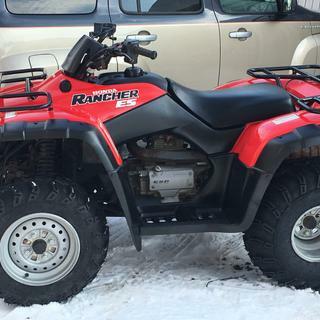 I needed new tires for my 2007 Honda Rancher 400 AT and started looking on RM to see prices and brands. Found the ITP mud lites had good reviews and price was excellent considering there was a $50.00 rebate on a set of 4. While browsing I also seen some ITP black steel rims that were reasonably priced (since mine are all beat up) so I decided I would order those also. So I decided to start the tire builder process on the website but for some reason when I entered my size tires 24x8x12 front and 24x10x11 rears it would not let me. It kept saying tires unavailable ( even though searching the individual tire sizes it said they had them in stock. I called RM's customer service and talked to Thomas about my dilemma with trying to order online. Thomas started looking into it and found that he was having the same problem and couldn't figure out why. Thomas mentioned that he was new and didn't have an answer but instead of making something up he said he would find out why and call me back. 10 minutes later Thomas called back and stated the size I needed wasn't available for the tire builder package and I would have to probably have to go with a bigger size tire but both Thomas and I wanted some re assurance that a larger size would work for my Honda. So Thomas got a technician on the line ( I believe Josh ) who assured all would be great !! I can't say enough about the great customer service !!! So I ordered ITP mud lites in 25x8x12 front and 25x10x12 with the ITP black steel Rims and Motosport alloy tapered lug nuts. I ordered on Thursday April 12th and Thomas stated that the order would be in two shipments since one set of tires and rims was in Kentucky and the other in Utah with the first shipment arriving on Monday and the second on Wednesday. To my surprise the first set of tires and rims where on my doorstep the Next afternoon Friday 13th (wow fast) and the second set of tires arrived Tuesday 17th. Cant say enough about RM. I would like to thank Britni for her help also when I called to order ITP wheel caps for my new rims since my old ones did not fit (something to think about if your order new rims ) BTW they arrived the very next day. I just got back from riding with my new tires and rims at Royal Blue ATV park in Tennessee and man could I tell the difference with grip and performance of these tires ! I can't comment on tread life yet but they seem to be well made ! For anyone looking for a good priced tire I don't think you can go wrong with these and Would not order from anyone else than ROCKY MOUNTAIN ATV/MC !! Great set of tires put them on front of my redline revolt. Awesome traction and great cornering traction also ! Highly recommend!! Great tire so far! Great company, keep it up RM! Have ordered several products from RM and everything is good! So far tires are amazing. Gets you through the mud! Worked great for messy trail riding and after miles and miles of riding there doesn't look to be much wear. The price is right especially if you do the bundle. Looks awesome on my daughters 350 rancher. Takes her everywhere the boys are going. Superior traction! Tons of grip! Handles like a champ! And the price, well I got more than I bargained for! Awesome tire. Great ride, like a whole new quad. Ordered in the afternoon and they were sitting on my front porch the very next day. 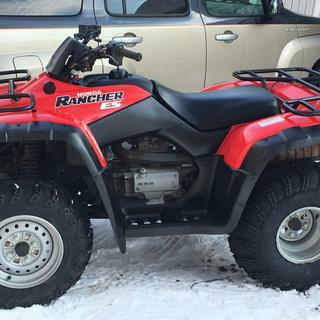 Rocky Mountain ATV beat everyone’s price, even out local stores. I've owned these tires before & i love them.This is the only ITP mud light tire i'lll every buy.You can't go wrong with ITP mud lights. The representative I dealt with was very nice and kind. help me get the right tires for my ATV. Very quick shipping. great tire, has performed very well. shipping was exceptional, order 1 day, delivered to my porch the next. These are great looking tires with a very good tread for handling ad traction. Best price anywhere and fast shipping. Is the 6 ply strong enough against punctures while trail riding? BEST ANSWER: Put the same tire on 2 different 2014 680 Honda Rincon's and haven't had a single issue with 2 years of mountain riding in the Rockies. Jagged granite trails to mud bogs and I've been nothing but happy. I've seen Can-Am's come out of there with a flat tire twice now, but those were stock tires and the machine is heavier as well. We run these on our ranch atv's and they hold up fairly well. The issue we have is the sidwalls failing. We have Yamaha Kodiaks. If the recommended pressure is run the flexing causes the sidewall to eventually crack and leak air. Running a slightly higher pressure may help prevent the cracking. Overall though my favorite replacement tire that we have tried. I had a set on a can am outlander for 3 years, never an issue with anything. Just put a new set on my ranger and I still haven't had any problems. We ride a lot of trails, creeks, swamps, and rocky terrain.... no problems out mud lites and I know I can count on them to get me there and back every time. Yes, they're on my Honda 400 and my sons. He has had them for over 2 years and travels in rough terrain with sharp rocks, roots, etc. he has never had an issue. I have been over some fairly rough terrain as well and I have had no problems. Have not gotten a flat yet. Strong and wears well on the trail. We have to ride a lot of "trail roads" as connectors, and they have worn well. Puncture resistance is the best quality of these tires, have had not problems with these tires on four machines. Yes but don"t buy ITP mud lite, they don't hold up! I need 26×12-12 you you have any? BEST ANSWER: Unfortunately, we do not carry these tires in that size. However, we do have the ITP Mud Lite XL tire in that size. Do they fit well on 1994 Honda fourtrax 300 stock? BEST ANSWER: I use them on two Fourtrax 300 2WD, and on one Fourtrax 300 4WD, stock sizes on rears with no problems. I use the stock size, but on a 12 inch ITP rim on the front of all three to clear disc brake conversions, again with no problems. I'm sure that if you buy the correct size, they will fit well. They are great tires - will take you through all types of terrain - mud sand, rocks, snow. These tires are an excellent fit on a Honda fourtrax. I have a 2015 Honda 500 pioneer, it's specs call for a 24_10_12tire but this sight shows a 25-10-12 tire which is higher than my front tire? BEST ANSWER: if your pioneer is 4 wheel drive you will need to keep your tires same size if not just be sure you have Clarence on your machine. these tires work very well on my Polaris sportsman 500 HO. happy trails. fits fine on mine just make sure what the operation manual about the transmission calls for if you have a 4x4 which I have. So is that a question? It will probably fit without any issues. It’s probably going to change the feel and the power. Specs are 24-10-12. I would stick with that size. will be using these tires hilly farm pasture will they tear up the sod when its dry and are they bias tires? They will not mark if it is dry. Are these tires bias or radial ? Radial, very good tires! Have them on two different wheelers, and am very impressed with them! i had trouble with tires not getting a good bead and leaking off is this common? BEST ANSWER: It is not a common problem. First, I would check your wheel and make sure there are no cracks or leaks by filling it up with air and submerging it into water to see if it bubbles. You can also get a spray bottle with soapy water and spray it on the tire to see if it bubbles. If you see it bubbling you have found the source of your leak. Second, I would check the valve stem and valve that they hold the pressure and do not leak (possibly replace them). Lastly, I would check the bead to make sure it is clean and free of debris by removing the tire off the wheel and cleaning it thoroughly. especially with low pressure tires, they need a bead sealer put on when mounting. Yes, I have these on 2 Honda 400 Forman atv’s, great tires for the buck !!! I will buy again ! 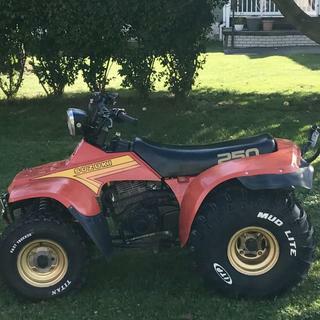 I have a 1999 Honda trx300fw 4by4atv. My front tires are pretty worn but my back tires are still good. Can I just replace the 2 front tires? BEST ANSWER: Yes you can but we always found it easier to da all 4 at one time, then they wear the same. The tires your looking at are great! We used our ATV's for work and they held up great. Hope this helps. I'm sure the manufacture suggests changing all 4, but I have changed the front and rear at different times and never had any problems. Hope this helps. Does these tires have to be mounted on beadlock rims? BEST ANSWER: No, they can be mounted on just a standard ATV/UTV wheel. Are these tires priced for each or per pair? BEST ANSWER: Price is for each tire. Approximately how much does this tire weigh in 25x10x12? What is the difference between 25x12.00-9 and 25/12R-9 atv tires? BEST ANSWER: the "R" stands for radial which would be the only difference. When you order these tires do they come in pairs or do you order 2 for the front and 2 for the rear? BEST ANSWER: The price is per tire. If you need 2 tires you will need to order qty 2. What ply are these tires? I would like my tires taller than stock want 26x10x12 can I order this way? 25x12-9 fits a 9 inch rim correct? So when you buy 4 do two of them come wider for the rear and the other two skinny? BEST ANSWER: You will need to enter in the size of tire you want to order. If you order 4 of the same size they will all be the same size. If you need two narrower tires for the front then you will need to order 2 tires in the narrower size and 2 in the wider size. For example two (2) 25x10-12 and two (2) 25x8-12. Are these made the same as the ML AT if I wanted a 22x8AT instead of the 22x7SP?